The house is situated 3 miles south of Torrevieja, and 23 miles south of Alicante Airport. Murcia Airport is about 14 miles south of the property. The main road N-332 (Alicante-Cartagena) links Torrevieja with Alicante. It passes along the coast and bypasses many towns and villages on the way down. 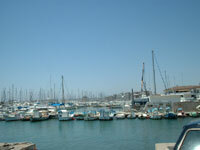 There are daily bus services which link Torrevieja with Alicante and inland villages. On leaving the airport follow the signs for Cartagena or the N-332. Once on this major road continue south for approx. 26 miles, passing Santa Pola, Guardamar, and Torrevieja on your left. On leaving the airport follow the signs for the A-7 Motorway. Take the motorway ensuring you take the southern section turn off for Cartegena halfway down the A-7. Alicante 47 km 30 mls. Amapolas II 5 km 3 mls. Barcelona 570 km 356 mls. Benidorm 77 km 48 mls. Cartagena 55 km 34 mls. Elche 35 km 22 mls. Madrid 445 km 278 mls. Murcia 46 km 29 mls. Guardamar 12 km 8 mls. Orihuela 31 km 19 mls. Santa Pola 33 km 21 mls. Valencia 217 km 136 mls.